WAND Taxonomies Blog: Need a taxonomy for an IT department? Need a taxonomy for an IT department? 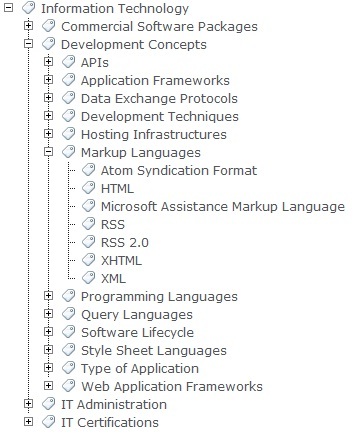 WAND has just completed the first build of an information technology taxonomy, with over 1,700 categories to help an IT department organize its content. WAND's new IT Administration Taxonomy (is that the right name for it? I'm not yet sure) includes commercial software packages, programming languages, IT certifications, IT administration processes, and more. 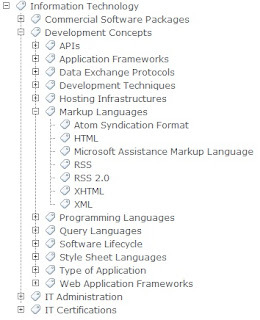 The taxonomy is ready for import into SharePoint 2010 term store or any other ECM software environment that can leverage a taxonomy, such as Oracle UCM. We have talked to hundreds of customers who are working on ECM implementations, particularly SharePoint 2010 conversions. Many of these customers have information technology documents that needs to be tagged and searched. We created this taxonomy to fill this niche and help IT departments jump-start an ECM taxonomy project. Reach out if you'd like to see a demo of this taxonomy.